ALSO NOTE: There are a few changes to the offer mentioned in the free webinar. The 4 part class is now open to everyone! There is no longer a limit to the class size and no time limit for signing up. Just come on back and join us when you are ready - we'll be here! This is a lifestyle that we love and I am often asked what exactly we do that has allowed us the freedom to work from home together and gives us the flexibility to work the hours that we choose. I'm not big into hype and sales pitch, so I'll just move right down to the bottom line and tell you what I can do to help you move your business (or your idea for a business) forward. A few weeks ago, I finished a 4-week LIVE class on the 8 Steps to a Profitable Online Business. I walked my class mates through each one of the steps in detail, showing them my computer screen so that they could see exactly what I was talking about. And I recorded all 4 of the sessions along with the Q & A! 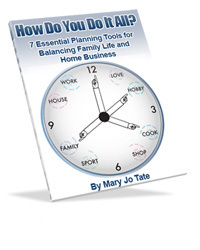 Now, I am making the course available to you to watch and learn on your own timeframe. Yes, the live sessions were recorded so that you can watch them any time that suits your schedule. You may not have been able to attend the live training sessions because of your busy schedule (or perhaps you didn't even know about it!) and that's okay. You now have unlimited access to the recordings. Besides, you might want to watch them more than once! How to KNOW there is a demand for your product before you create it. How to get that great idea off the ground. How to market your product inexpensively, but effectively. How to run an efficient, yet personal, business. How to engage your audience and keep them coming back for more. If this sounds like just the help you need, sign up for the 8 Steps to a Profitable Online Business webinar series below. "Anyway, just wanted to thank you again for being a blessing to me and for your kindness. I'm excited to see where the Lord directs me. * liked the feel of actually being there with you (again, this is a really neat format...webinars)"
Working from home while bringing up a family can often seem like an overwhelming task—better suited to Supermom than ordinary mortals. As a single mom with four energetic sons . . . whom I’m homeschooling . 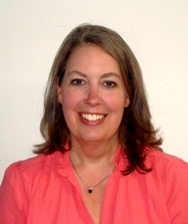 . . while growing my profitable home business as a writer, editor, and book coach, I’ve battled with all those challenges. People are constantly asking me, “How do you do it all?” Well, I’m not Supermom (who wants to wear a cape anyway? ), but I have developed powerful strategies that cut through the chaos and get results. 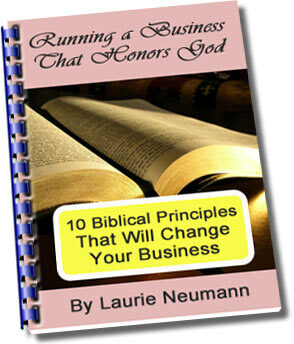 Laurie Neumann, owner of Christian Home Business Connection offers personal coaching to help you choose and get going in a successful home based business. Are you looking to creatively supplement your family's income? Would a home business even work for your homeschooling family? 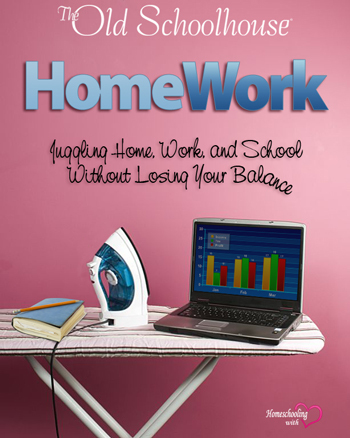 Whether you are. . .
. . . this E-Book, HomeWork: Juggling Home, Work, and School Without Losing Your Balance contains the information and support you are looking for! THIS BONUS is not business related, but is offered to refresh and encourage you in your other roles! Encouraging you with wisely spoken words. Convicting your heart as He refines you into His image. Challenging you to continue to strive for improvement. Touching your spirit with heart-warming stories. Entertaining you through life-learning lessons. Inspire you to immerse yourself in the holy promises that are yours. 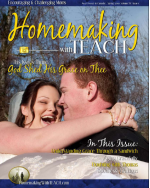 Each issue of TEACH covers a specific topic, topics that are relevant and revealing for homemakers and homeschoolers. Yes, of course, we have a 100% guarantee for the class. If you do not LOVE the first class; then you can send me an email telling me so and I'll fully refund your money. You get to keep the bonuses. Fair enough? P.S. You can sign up for this class anytime at the regular price, but putting it off won't help you in any way. Besides, you won't find a class with this much content and helpful step-by-step advice at this price (or even 3x this price). And, of course, we do have a 100% money back guarantee if you are not satisfied! P.P.S. It wasn't so very long ago that I had no idea how to build a website, write a sales letter, set up a newsletter or market our products. But through trial and error and then the help of a good mentor, we have grown our business to surpass that of my husband's ex-job income. We now run a profitable publishing company that has grown every year, even in recession. This is not to brag whatsoever (we absolutely thank and trust the Lord for our monetary blessings); just to tell you that these dreams of yours can be realized. You can make money from home even in your very limited amounts of time. God bless!